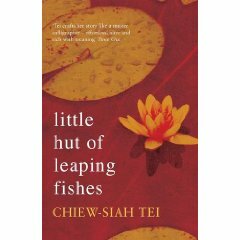 author will read from her book, discuss the process of writing and researching the book, and why the story matters, not only to her personally but also to all overseas Chinese. It is my great pleasure to invite you to London in September 12-13, 2009 to participate in the 15th annual Meeting of Chinese Life Scientists Society in the UK (CLSS-UK). After the extremely successful CLSS-UK 2008 annual meeting in Oxford, CLSS-UK committee has decided to hold the 2009 annual meeting with outstanding scientific quality in University College London (UCL). The meeting will take place in the Life Science Building in UCL main campus. The aim of the conference is to provide a platform for Chinese life scientists in UK to exchange ideas, share experience and establish collaborations with each other and also with life scientists in China. The Organising Committee is already working in order to ensure a wide choice of lectures covering the various aspects under the theme of Life Science and Medicine. In 2009, we are planning to invite some high profile professors and senior scientists from UK and China to give lectures in this meeting. We particularly encourage young investigators and PhD students to join the meeting by offering a number of travel grants and prizes for the best oral and poster presentations. In addition, National Natural Science Foundation of China, China Academy of Science and some High-technique Districts from China will be invited to join our meeting which provides bridges to China for our members who would develop their careers in our motherland. The full scientific program can be found in this link. 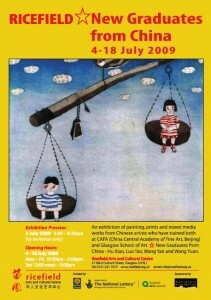 An exhibition of painting, prints and mixed media works from Chinese artists who have trained both at CAFA (China Central Academy of Fine Art, Beijing) and Glasgow School of Art. Prize-winning painter Wang Yuan, together with painter Wang Yan, print-maker Luo Tao and animator Hu Xiao combine the high standard of craftsmanship demanded in China with Western art elements. 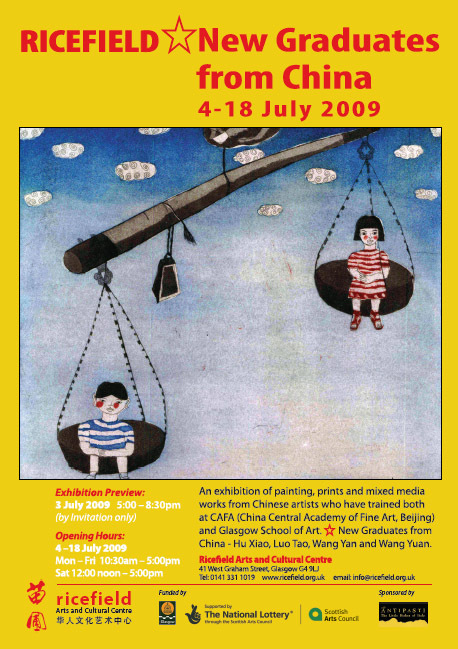 Conceptually, their work owes much to the Chinese Avant-garde movement, which has been taking the world by storm since 1989. These artists bring a refreshingly global outlook to the Scottish art scene. International classical zheng performer DONG Yi returns to Edinburgh to bring us to a spiritual journey throughout China. Zheng (also known as gu-zheng and Chinese zither) is the most popular Chinese national instrument over the world with a history of at least 2,500 years. Classical zheng performer DONG Yi is the last pupil of Prof. CAO Zheng, the “Father of Modern Chinese Zheng” and the most celebrated instrumentalist of Chinese national music of her generation. She became the youngest ever member of Chinese Musicians’ Association, the highest institute of the Chinese musicians, at 21 and is the first ever Chinese national musical instrumentalist who gave public recital in the Great Hall of the People. Since the age of 13, she has been giving almost 20 public recitals and nearly 100 performances in various cultural exchange events between Mainland China and Britain, US, France, Germany, Japan, Hong Kong and so on. Her music has led to many honours and awards, including the title of “Audience’s Favourite Performer” in 2003 International Music Day Scotland as well as the Award for the Best Music Art Film and the only New Generation Award of the Committee in 21st Century Budapest International MTV Art Festival. China Record Corporation has published five of her albums since 1999 including the most recent two that have been recently nominated for 2009 China Golden Record Award (the equivalent to the Grammy Award in Chinese-speaking world). 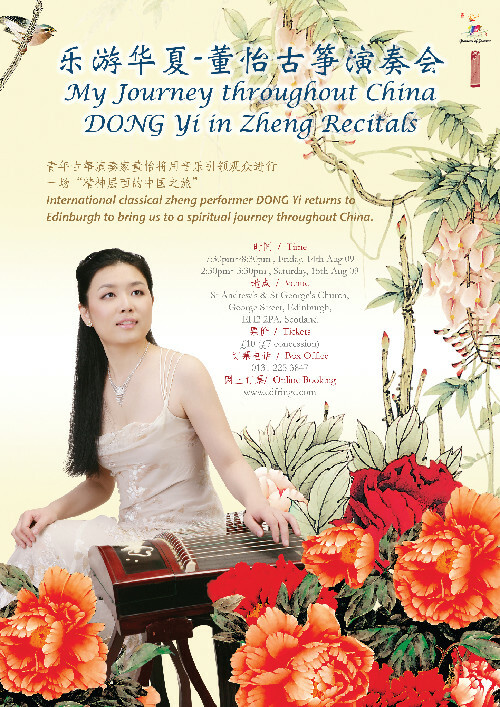 She is going to play works of five different schools of traditional Chinese zheng and a few renowned modern pieces to bring us to a spiritual journey throughout China.